Dr. McGourty was drawn to chiropractic at age 13 when she endured a spinal injury as a competitive gymnast and was told by doctors that a future participating in sports was improbable. With chiropractic treatment, Dr. McGourty was able to compete in softball, volleyball, track and gymnastics throughout high school and continued to participate in intramural volleyball and softball through college. 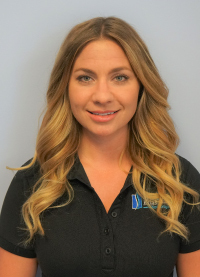 Her positive experience with chiropractic at a young age, paired with her passion for helping others, is what inspired her to become a sports chiropractic physician. Outside of practice, she enjoys spending time with her family and friends, working out, cooking, and volunteering in community service activities. Dr. McGourty received her Doctorate in Chiropractic from Palmer College of Chiropractic in Port Orange, FL and her Bachelors of Science degree in Exercise Physiology from East Carolina University in Greenville, NC. Dr. McGourty is Board Certified by the National Board of Chiropractic Examiners in chiropractic and physiotherapy and licensed by the Virginia Board of Medicine. Dr. McGourty is a certified provider in Graston Technique, and Active Release Technique. Are you ready to see how chiropractic care can change your life? *Saturday hours are for massage appointments only.